I have always been skeptical about making beverages at home. Apart from the basics like Coffee, Chai tea, Green tea and an occasional Matcha green tea, i have not really experimented in the realms of drinks. After a lot of persuasion and confidence boosting by my husband, i recently started making smoothies at home and i can say with excitement that i am catching on the “drink mania”. 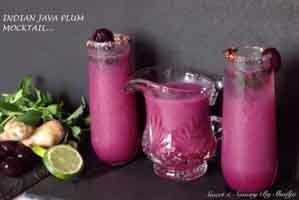 Well this post is not about smoothies, it is about “Mocktails”. Just last week, the team DFT decided to develop beverage recipes for diabetes patients. It sounded like a great idea and so i jumped onto the task of reading about the super foods for diabetes. 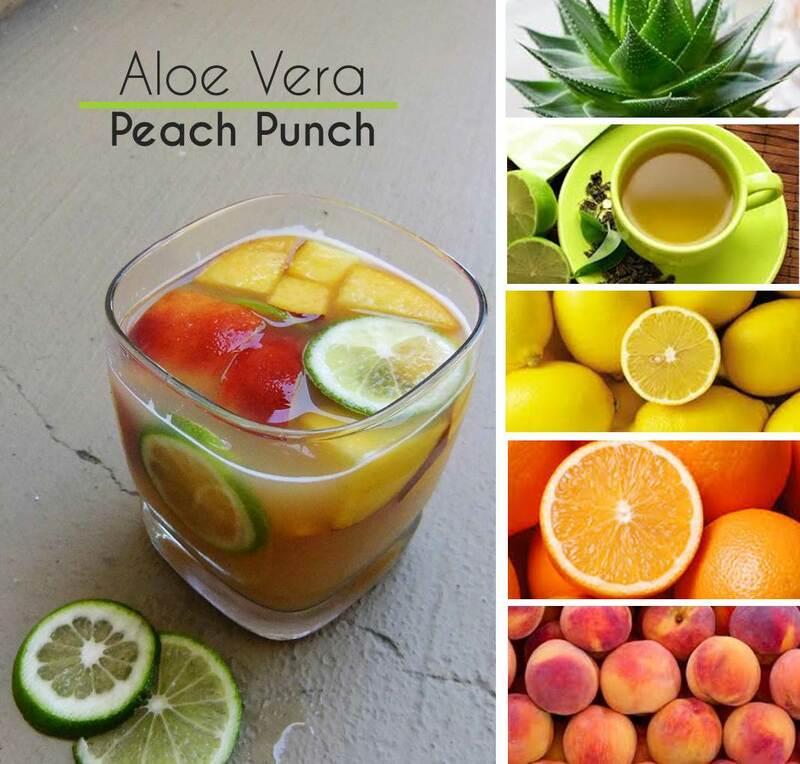 This recipe is a combination of various exciting, diabetes friendly ingredients – Aloe Vera, Green tea, Lemon, Orange and Peaches. WOW ! In a pot, put some water. Place peaches in the pot and bring to boil. Shut the flame and let it rest for about 10 minutes. Remove the peels from peaches and blend it in a blender till smooth. Peach nectar is ready. In a separate pot, heat 500ml of water to a boil. Add green tea bags in the water and shut the flame. Let it steep for 10 minutes. Strain and keep the green tea aside. Cool down and refrigerate till chilled. 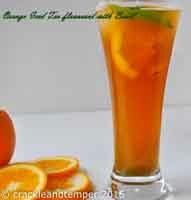 To assemble, mix the green tea with the blended peach nectar, orange juice. Mix well. Add in Aloe vera chunks and lemon juice. 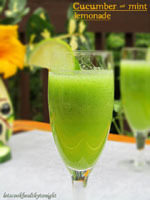 To serve, in a glass, add the peach chunks, ice cubes and slivers of lime. Pour in the green tea-peach blend. Serve chilled. Aloe Vera – Preliminary research suggests that intake of aloe vera juice can help improve blood glucose levels and may therefore be useful in treating people with diabetes. Decreased blood lipids (fats) in patients with abnormally high levels of these molecules in the blood (e.g. some people with type 2 diabetes) and/or acute hepatitis (liver disease). Aloe Vera also helps in decreased swelling and faster healing of wound injuries. Leg wounds and ulcers are common complications of diabetes. Green Tea – A study using mice published in the “British Journal of Nutrition” in April 2011 found that an antioxidant found in green tea called epigallocatechin gallate, or ECGC, may help delay the onset of Type 1 diabetes. Other animal studies have shown that green tea may help regulate blood glucose levels and help slow the progression of this condition once you have it. Drinking caffeinated green tea may help lower your risk for Type 2 diabetes. Study participants who drank at least 6 cups of green tea per day had a 33 percent lower risk for Type 2 diabetes than participants who drank 1 cup or less per week. Lemon- For diabetics, controlling blood sugar levels is of critical importance. Diet and exercise play a big role in helping to regulate blood sugar levels. Since many diabetics tend to be overweight, losing weight and then keeping off the extra pounds is an important aspect of diabetes management. Lemon water is good for diabetics as a means of controlling blood sugar levels. Lemon juice is good for diabetics mainly because of its high concentration of vitamin C.
Oranges – Orange is one of the fruits for diabetes. American Diabetes Association considers oranges as a “diabetes superfood” and encourages including oranges in the diabetic diet. Oranges have a low GI (33 to 51) and diabetics can consume one orange per day. Oranges have very high content of soluble dietary fiber which helps in controlling blood glucose level by lowering the sugar absorption rate. Oranges also contain several antioxidants in high concentration which are helpful against several ailments including diabetes. Peaches- Fragrant, juicy peaches are a warm-weather treat and can be included in your low-carb diabetic diet. Peaches contain vitamins A and C, potassium, and fiber. Peaches are delicious on their own or tossed into iced tea for a fruity twist. One raw medium peach (147 grams) has 50 calories, 0.5 grams of fat, 0 grams of cholestrol and sodium, 15 grams of carbohydrate, 13 grams of sugar, 2 grams of fiber and 1 gram of protein. 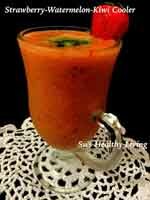 It provides 6% of your daily vitamin A needs and 15% of daily vitamin C needs. One medium peach also contains 2% or more daily value of vitamins E and K, niacin, folate, iron, choline, potassium, magnesium, phosphorus, manganese, zinc and copper. Disclaimer I am not a nutritionist or dietician. My knowledge and information is based on my research and reading from different resources. Please consult your doctor or dietician before making any changes to your diet. Tagged beverage, Diabetes friendly, Drinks, Healthy, Quick, Summer. Using aloe vera in a drink is pretty new.. gonna try it soon. Never realized that aloe vera could be used in a drink. This is super healthy and delicious! this truly is a WOW-some drink! a winning combination and so enjoyable too! yes, I have read about aloe vera. Looking at your pictures and description, I am so tempted to try this ! 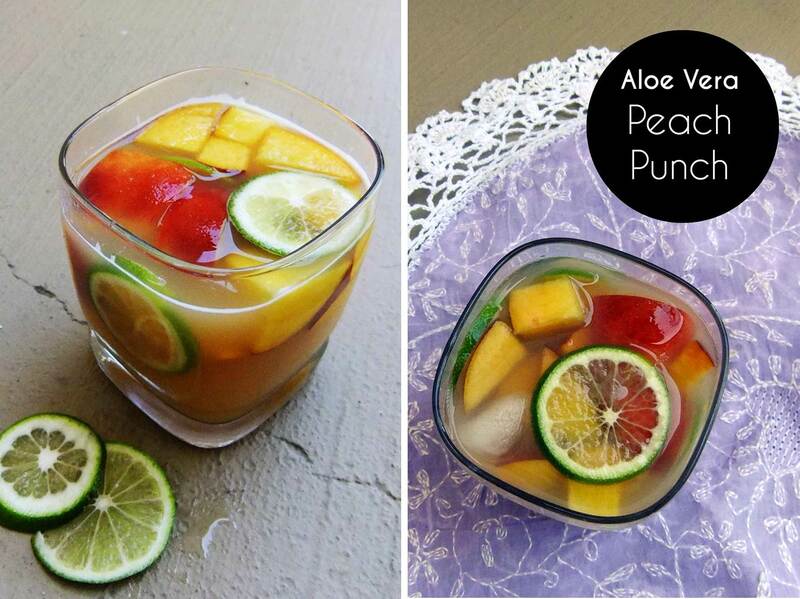 That punch looks so tempting and refreshing! I would have it any day! Awesome pics! 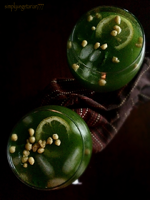 Pingback: CUCUMBER AND MINT LEMONADE | LET'S COOK HEALTHY TONIGHT!